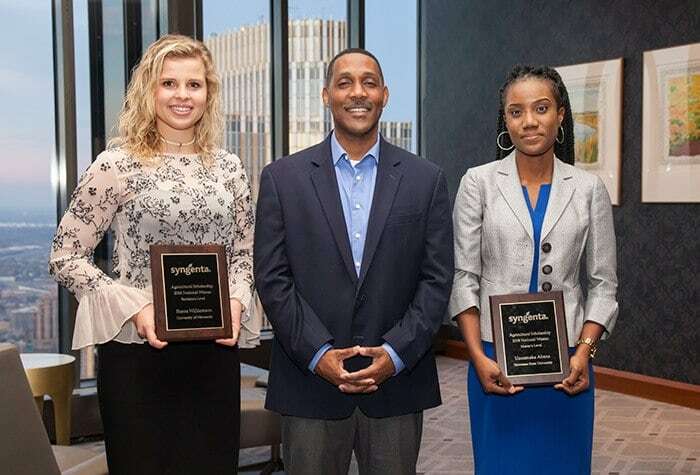 Syngenta Agricultural Scholarship winners Sierra Williamson (left) and Uzoamaka Abana (right) join Wendell Calhoun, Syngenta communications manager, at the 2018 awards ceremony in Minneapolis. Every applicant of the 2018 Syngenta Agricultural Scholarship had a unique spark that first ignited his or her passion for agriculture. For Uzoamaka Abana, the 2018 national winner at the master’s level, that spark was her grandmother’s self-sufficient farm in Nigeria. She recalls being fascinated as she watched crops bear fruit and livestock develop to provide meat. But as a young child visiting her grandmother’s village, she also developed a deep, personal understanding that agriculture could be challenging. “My grandmother’s crops and animals did not do well at times, which inspired me to want to figure out why and how it could be done better,” Abana says. Based on those formative experiences, Abana has decided to pursue a career in agriculture and help farmers be more productive, so they can provide food for their communities and the growing worldwide population. She is currently a graduate student in plant science at Tennessee State University. The 2018 @SyngentaUS Agricultural Scholarship winners aspire to help feed the world’s growing population. Joining Abana in the 2018 scholarship winner’s circle is Sierra Williamson, the bachelor’s-level winner who is majoring in food and agricultural business at the University of Minnesota. Williamson’s unique spark to pursue a career in agriculture was her family. She was raised in rural Minnesota, where her father and grandfather worked in the seeds business. They instilled in her a respect for the farmers who helped put food on her table. In addition to this year’s two national scholarship winners, Syngenta awarded the fifth-annual Syngenta Agricultural Scholarship to five other regional winners in October. The scholarships will help bolster their academic and career aspirations. These students represent the future of the agriculture industry, and Syngenta is proud to support agricultural education through the scholarship program. The winners of the regional scholarships at the master’s and bachelor’s levels are all promising students focused on careers in agriculture. Bachelor’s-level winners were Jake Johnson (Mississippi State University), Kayla Beechinor (Washington State University) and Dana Mulligan (Virginia Tech). At the master’s level, recipients were Alexa Davis (University of Nebraska–Lincoln) and Kaitlin Hadaway (Washington State University). For these winners and all of the other 2018 applicants, the centerpiece of the scholarship application was an essay in which they told their personal stories of how they became #RootedinAg. Applicants described the event, person or moment in their lives that ignited their passion for agriculture and inspired them to pursue a career in the field. While all of the winners of the 2018 Syngenta Agricultural Scholarship found their way into agriculture along different paths, they all share the same lofty goal—to help feed the world. The global need for food is exploding, as the world’s population rises and available farmland diminishes, creating a vital challenge for the agriculture industry. Both Abana and Williamson say this challenge is part of what drew them into agriculture and inspires them to pursue careers in the field. Past scholarship winners have found the award instrumental in furthering their studies and giving shape to their future career goals. Abigail Han, the 2017 national bachelor’s scholarship recipient, says the award has enabled her to pursue opportunities without the added financial stress that internships and other activities can bring. After graduation, Han will return to Kansas to complete a yearlong research co-op with the Land Institute and then plans to pursue a doctorate in an agricultural-related field. Aimee Uyehara, the 2017 master’s-level winner, is currently earning her doctorate in plant biology at the University of California, Riverside. She says the scholarship has given her the confidence boost and financial stability to pursue a higher degree and become a mentor, much like the professors who inspired her. “I want to contribute to the field in the form of mentorship and provide research experience for undergraduate students,” Uyehara says. Syngenta is proud to support these and other students’ continued education, as they help shape the future of the agriculture industry. For more information on how to apply for the 2019 Syngenta Agricultural Scholarship, visit www.syngentaus.com/scholarships.